This past week, Mexican starchitect Enrique Norten and his firm TEN Arquitectos announced that he had designed no fewer than four new projects for New York City. That is surely interesting and would be even more exciting were it not for the fact that Norten’s noble and elaborate plans for buildings in the Big Apple have a strange, meandering way of coming up empty and then fizzling out. He was behind the design of the performing arts library in Brooklyn and the lofty hotel at Park Avenue and 125th Street, which were never built due to financing. But, Norton does have at least one major New York building to his name, the nearly completed One York, a 32-unit Residential Condominium On Sixth Avenue And Canal Street. The general idiom in which this architect works is a sharply angled, syncopated and geometric reinterpretation of the Mod language of the 1960s. That is to say that there is little that is curved or organic in his general usage of forms, though it is leavened by a certain measure of humor, retro chic, and intimations of the machine aesthetic. That idiom is fully evident in the new projects. The most striking example might be that of Clinton Park, a mixed-use Development On 11th Avenue between 53rd and 54th streets. In the initial rendering, it looks like two pale buildings with a common base that are connected by a stunning sequence of staggered steps. The second project, Cassa Hotel, is a cross between a condo and a boutique hotel. Shaped like a pale obelisk, it is supposed to rise at 70 West 45th Street. Meanwhile, at another boutique hotel, the pale, wraith-like Hotel Habita Hotel Chelsea, at 516 West 27th Street, promises to re-enact the most striking feature of this architect’s Habita Hotel in Mexico City, namely the way that structure has been wrapped in a translucent glass skin that extends about three feet on all sides from the main structure. Finally, Norten has designed a 30,000-square-foot condo at 580 Carroll Street. 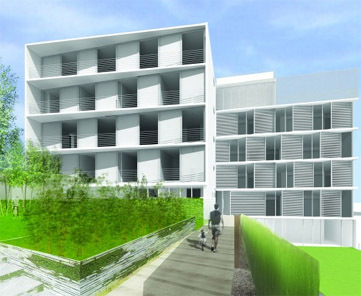 Its 17 units are packed into two neat boxes, again pale white in the renderings. The apartments fit imperfectly into these boxes in such a way that balconies are generated from the irregular joining of the interior and the exterior.